It’s FINALLY time for the nitty gritty! 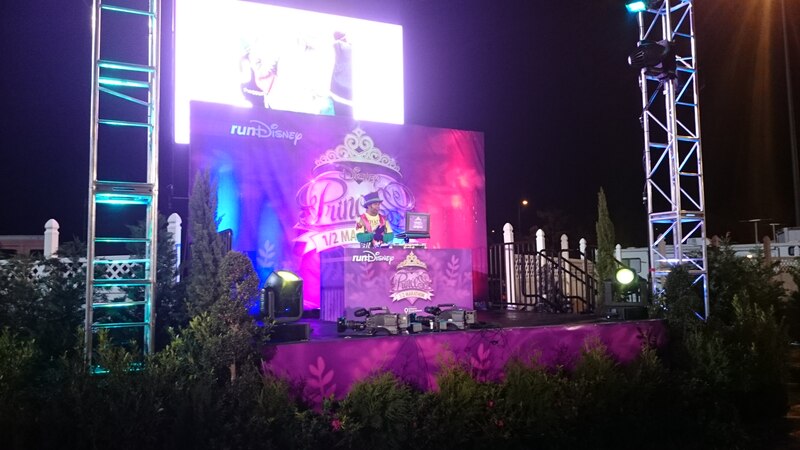 Race day during Princess Half Marathon weekend at Walt Disney World Resort! And now, without further ado…. Sunday, February 22, 2015. 2am. I had my alarm set for both 2am and 2:15am but I was so excited and nervous that I had no trouble waking up at 2am. 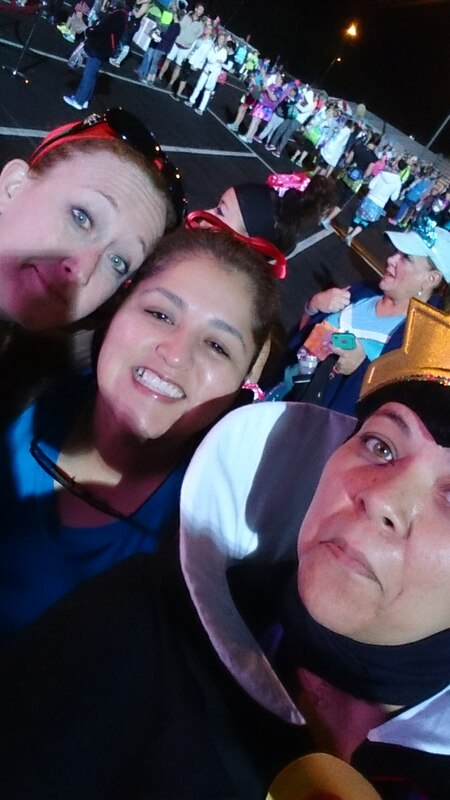 Shari, Cynthia and I got up and started getting dressed for the half marathon. 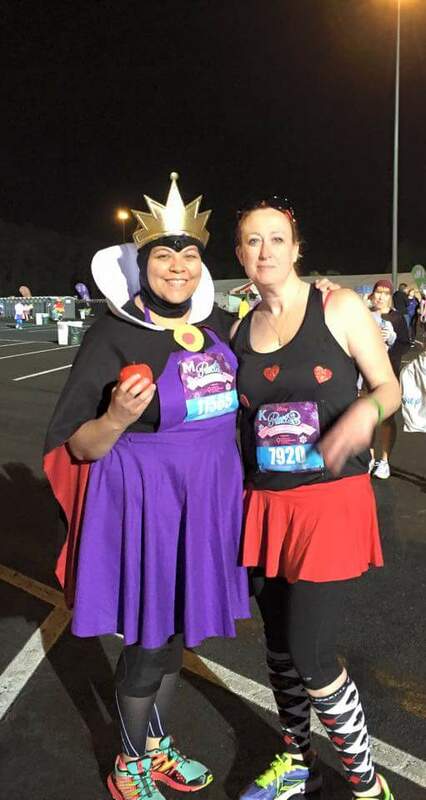 We needed to be at the bus stop at Coronado Springs at 3am to head to the race start location. I have to be honest, I don’t remember much of any conversations that we had in the room as we got ready for the race. I was so nervous. All I could think about was the fact that I did not want to get swept. All I kept thinking (and possibly saying) was that I did NOT want to get swept. 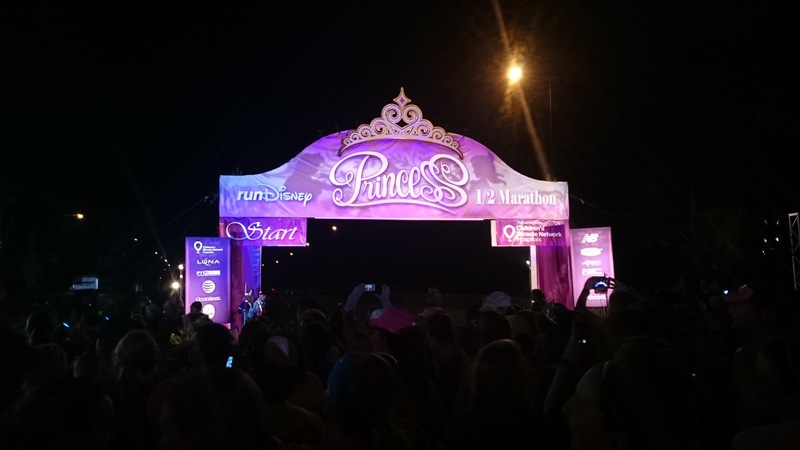 In case you’re not familiar…getting swept is the term for what happens when a participant in a runDisney race does not keep up the required 16 minute per mile pace during a race. At certain checkpoints, those who are below the pace (which is kept by pace keepers on bikes as well as by The Balloon Ladies) are not permitted to continue the race and are loaded onto a bus and driven to the finish. I’ll talk more about this later. Like I was saying, I was worried about getting swept. I think this set the tone for my race. I was already psyching myself out and I was doubting myself way too much. This was not race mistake #1, but it was a big mistake. I was so nervous that I felt nauseous and I knew that if I ate my peanut butter sandwich that I was going to be sick. So I didn’t eat anything. I count this as race mistake #1. I actually didn’t even want to drink anything because I was worried about having to stop at a port-a-potty and getting set back with the lines there. Mistake #2. Once we were dressed, we headed to the bus stop. 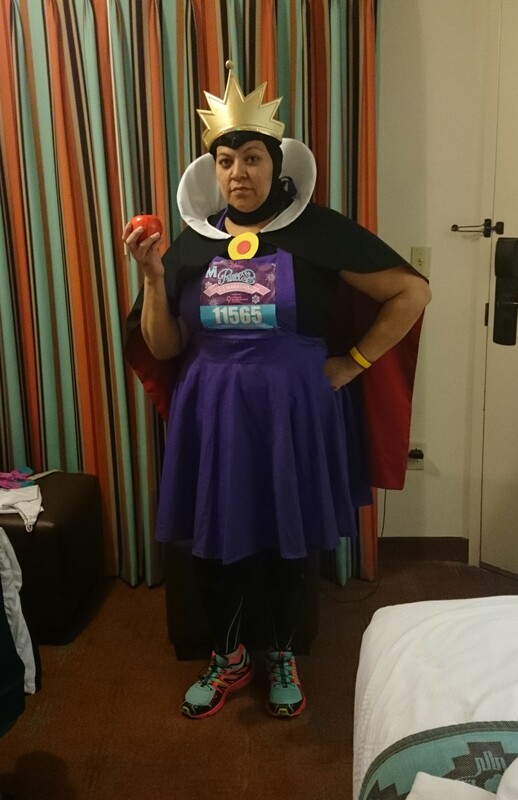 I was surprised by how comfortable I felt in my costume. That was a good thing because I was worried I was going to be majorly distracted by the collar on my cape. The apple was fake, but yes, I carried it the entire time. My hands tend to get numb when I run unless I’m holding something so having my phone in one hand and the apple in the other kept my hands from getting numb. Apparently not everyone takes the “be at the bus stop at 3am” suggestion seriously. There weren’t that many runners on that early bus headed to the race. 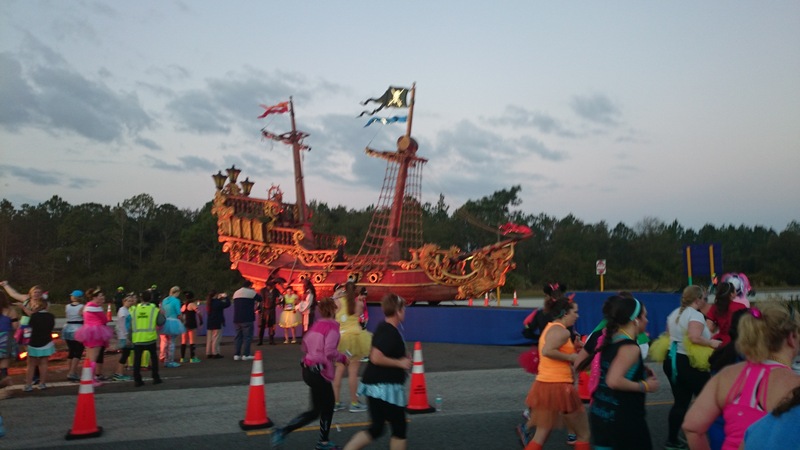 Once we got to the pre-race area in the Epcot parking lot, I was feeling a little less nervous. There weren’t all that many people there yet and we were trying to scope out where the corrals were set up. After a few minutes we figured out that the corrals weren’t in this area. But we took in the atmosphere and took some pictures. Cinderella and possibly another character besides Pocahontas were available to take pictures with but the line for Cinderella got insanely long and there was no way we were standing in the line to take a picture with her. After looking around for a few more minutes we decided to figure out where the corrals were and we walked over to them. 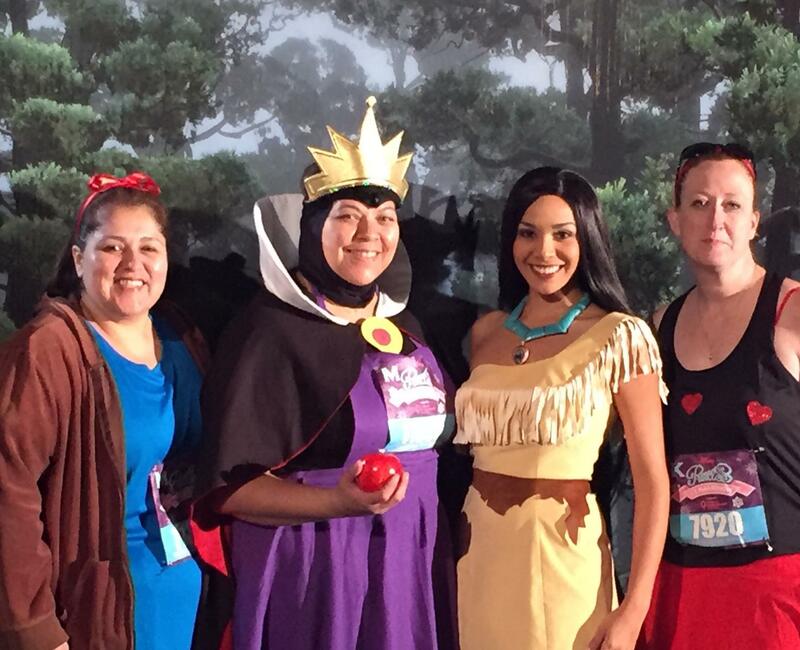 Once we found the corrals, we went to get into corral M. Shari was actually assigned to corral L but she opted to give up her spot in L to start back with me and Cynthia in corral M. As we waited we were able to see a lot of the costumes that people came up with. That alone was super fun! 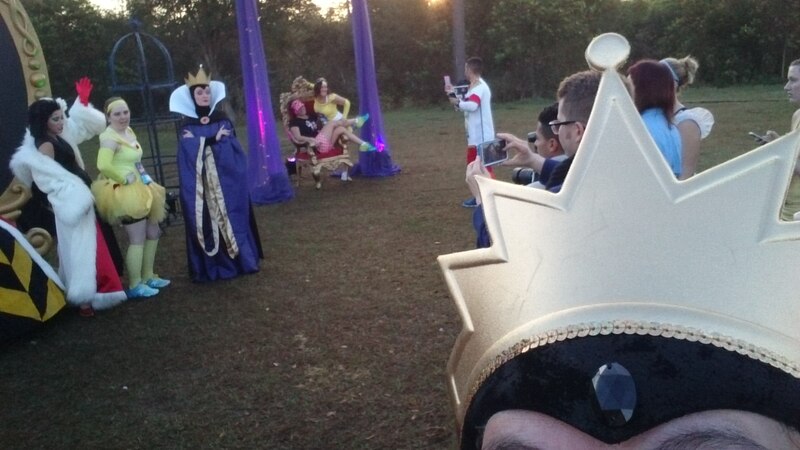 There were so many creative costumes! 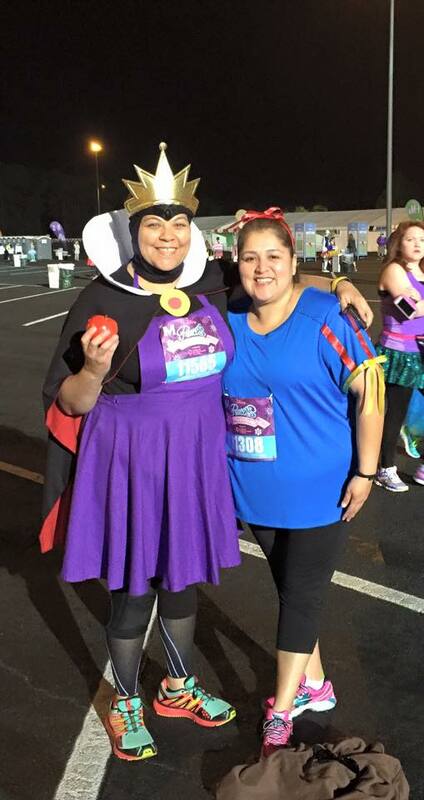 As we stood waiting for the race to begin, I actually saw a few people with whom I’ve met in Disney related groups on Facebook but sadly, not everyone was up for saying hello to me when I spoke to them. Eh…whatever….I’ll chalk it up to nerves. But now it was finally time to start the race. Every few minutes another corral was sent off on its way with an awesome countdown and fireworks! Corral M was finally up to the starting line and after our countdown and fireworks, we were officially on our way! For months leading up to the half marathon, Cynthia and I told Shari not to wait for us during the race because we knew she was faster than we were. She kept telling us that she was staying with us and that was gonna be that because we were in it together. Well, less than a mile into the race I started to feel like I had never run a day in my life. I immediately regretted not eating my peanut butter sandwich. This was bad. I told Shari I was going to have to make my walk interval longer than expected. I told her to go ahead without me and I was going to try to catch up. Cynthia was still with me but she told me not to wait for her. So less than a mile in, we’d split up completely. A few things happen now….one thing is that I managed to get myself going again with my run/walk/run intervals. However, I didn’t set my interval timer and I was just going along with some runners in my vicinity who were signalling the run and walk intervals for their group that was running together. A second thing was that I was getting caught up in the race entertainment and the cheering that everyone was doing about now. 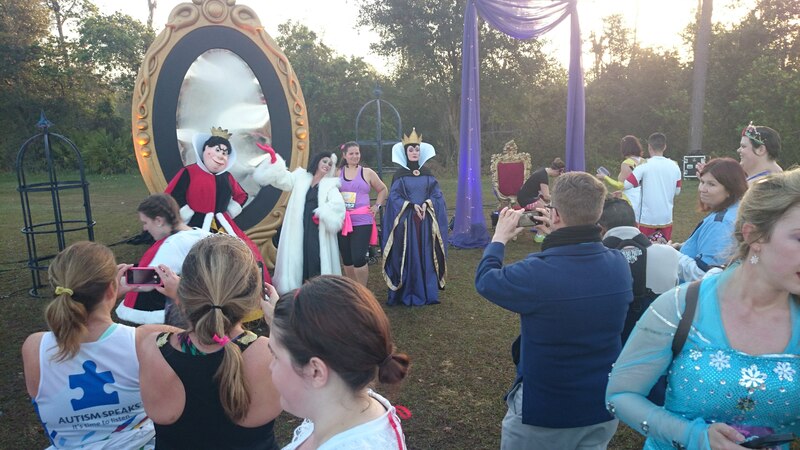 Any time that there was photo opp with a character of some kind or music along the course I got pumped up and started running more even if it was supposed to be a walk interval. I’m gonna call this Mistake #3. 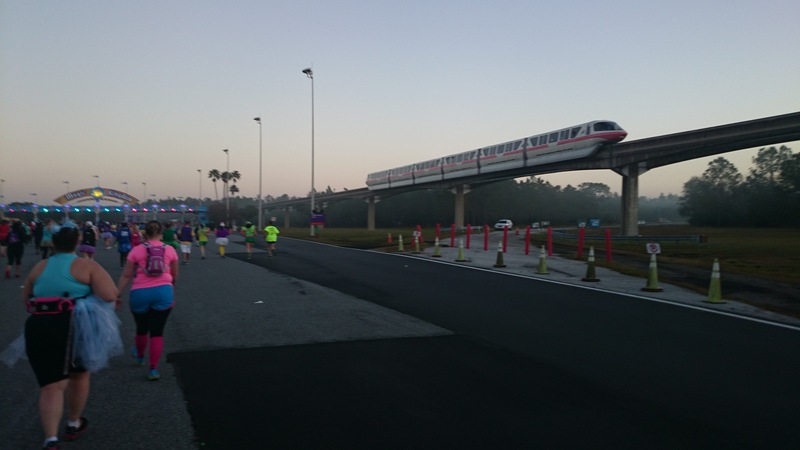 I think my favorite thing on the way to Magic Kingdom was that 2 out of 3 monorails that passed us along the race course honked their horns at us in support! It made everyone scream and cheer and something about that made me a little teary eyed. 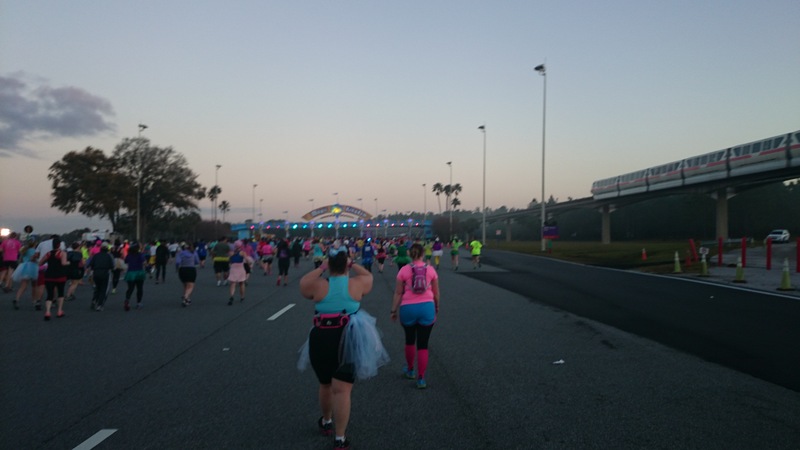 Anyway, the last thing of significance that happened on our way to Magic Kingdom is that I realized that not only had I not been keeping up with mile markers, I also wasn’t keeping track of my time and pace. Super duper Mistake #4. I remember seeing the mile marker for Mile 3, but after that I didn’t pay attention to a mile marker until Mile 6. I’ll go ahead and post some pictures I took along the course because soon I’ll have a lot less interest in taking pictures. Right around now I’m about to enter the Magic Kingdom by way of the off stage areas of the park. 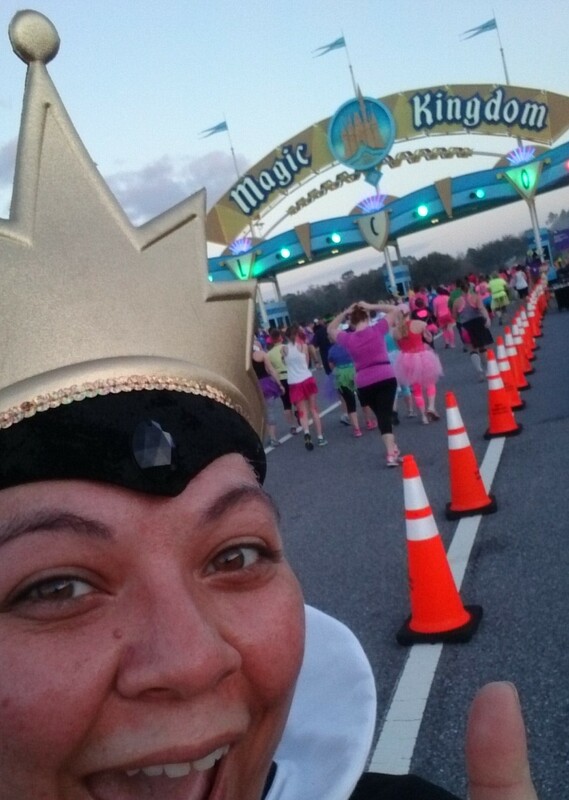 I could not wait to get to Main Street and Cinderella Castle! But since this post has gotten way long, I’m stopping for now. I’ll post the rest of the race within 24 hours! 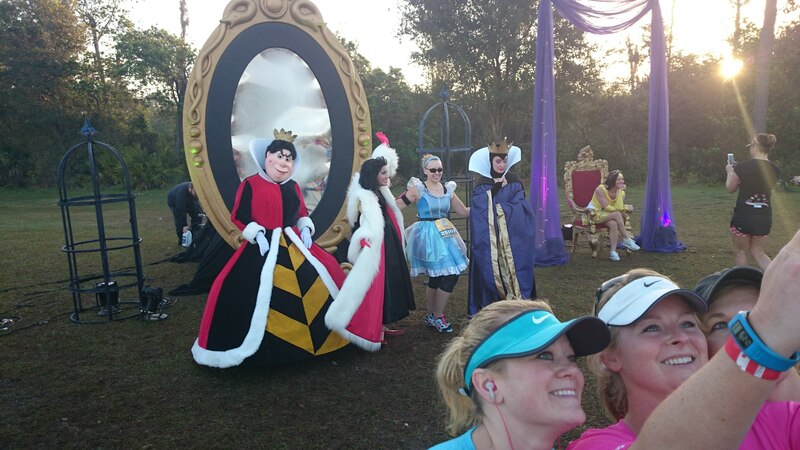 Posted by Shandale on April 30, 2015 in Running and RunDIsney, The Daily Post and tagged Disney, Disney Blog, Disney Magic, Disney obsession, Disney Parks, Disney Princesses, Disney Trip Report, Disney Vacation, Disney World, Disney World Trip, Epcot, Magic Kingdom, Princess Half Marathon, Random, RunDisney, Running, Solo trip, Walt Disney World, WDW, YouTube channel.